Martha V. Mance, nee Rozycke, 96, of Madison, Ill., born January 21, 1921, in Madison, Ill., died Friday, Dec. 8, 2017, in Madison, Ill.
Mrs. Mance was a cookie packer at Sunshine Biscuit Co.
She was preceded in death by her husband, Victor Mance, whom she married September 30, 1941, at St. Mary's Catholic Church, Madison, Ill.; her parents, Theodore and Frances, nee Liszewski, Rozycke; sister and brother-in-law, Cecelia and John Kozak; brother and sister-in-law, Alexander and Goldie Rozycke; and brother-in-law, Rolland Lux. 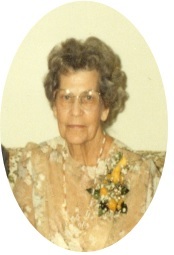 Surviving are her sister, Frances Lux of Madison, Ill.; and several nieces and nephews. Memorial contributions may be made in the form of Masses or St. Mary's Catholic Church, Madison, Ill.
Visitation: Friends may call from 9 to 11 a.m. Tuesday, Dec. 12, 2017, at Thomas Saksa Funeral Home, Granite City, Ill.
Funeral: Funeral Mass will be held at 11:30 a.m. Tuesday, Dec. 12, 2017, at St. Mary's Catholic Church, Madison, Ill., with Father Jeff Holtmann officiating. Burial will be in Calvary Cemetery, Edwardsville, Ill.